(03/06) My own original No.22 is added to PAGE-7 – the question is what’s the definition of the mechanism used?? The last article by P.A.Petkov – Help-series Problems with Black Series – is added to the Articles page. (02/06) The Russian version of Ankona section is ready! The announcements of the Tourneys received from you are being added to the Links page. In connection with the recently announced tourney Julia’sFairies-HSP-2012 and as an answer to readers’ interest to the new form of Help-Self Problem Julia’sFairies site is publishing IGM Petko A.Petkov’s article Help-series Problems with Black Series (originally published in the excellent magazine StrateGems #54 – 2011). An accent here is made to the special form of HSP where the play starts with the series of black moves, but white has a right to do just the last move, which forces s#1. All the problems shown as Originals are specially composed for this article in 2011. Dear Petko, thank you very much for all your efforts!! This article is devoted to an interesting type of series-movers in which Black executes the series, but at the end White forces selfmate in one move! This type is rather different from traditional ser-s#n in which White executes the series from n-1 moves and at the nth move White forces selfmate in one. Using Popeye, selfmate problems with Black series can be checked with stipulation ser-hs#n. Therefore, this denotation gives an impression that ser-hs#n is a modification from a well-known genre at present, hs#n. I tend to accept that the name “Series help-self mate in n moves” (ser-hs#n#) is better that the long name “Black plays a series of n-1 helpful moves so as to reach a position where there is a normal selfmate in 1”. It is interesting that nobody can cite even ten old compositions with the stipulation ser-hs#n! My rather huge personal data base has but a few such opuses. Thus, I found it hard to illustrate this article. I asked for help from other fairy experts and they responded. I received problems from Bo Lindgren (thanks to Hans Gruber), Peter Harris and Cornel Pacurar. I also included several of my originals. I should also mention the recently introduced Pser, which has a direct relationship with ser-hs#n. At the end of the article, I offer several new forms with rich practical possibilities and very surprising thematic nuances. This article is dedicated to the memory of Thomas Rayner Dawson (1889-1951). In my opinion, we need a new, creative approach to Dawson’s heritage in Fairy Chess, especially series-movers. Many new forms and ideas are possible. In this article I will accent a limited number of novelties which figure in my work plans. The series-mover is very old. Some such problems, known from Arabian manuscripts (XIII century), are cited by H.J.R. Murray in his A History of Chess (1962). I also know some older Arabian examples, but this special theme should be accented in a different article. As you see, we cannot ascribe 100% authorship to Dawson for series-movers. Nevertheless, his contribution is enormous because he formulated contemporary rules for them. His publication The Fairy Chess Review (1947) was a Fairy Bible. The ser-hs#n problems acted as a magnet for all fairy composers. Some historical information is needed, especially for younger composers. It is important to know what the special features of series-movers are and also to know the classical tendencies. We start with N1, a typical of Dawson’s miniature with excellent educational value. 1-7.Ke1 8.f1R 9.Rf2 10-16.Ka1 17.Ra2 Sb3#. 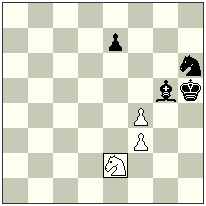 The stipulation ser.h=n, in which the mate is replaced with stalemate, appeared later (probably after 1950). The content of the earlier problems was rather simple. 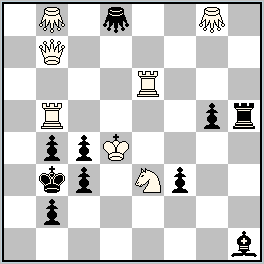 N2 1.Qh2 2.Kxg2 3-9.Kc1 10.Qc2 11.Qb1 12.Qa1 13.Kb1 Kd2=. Before 1960, many compositions with the stipulation ser.h==n, were also published, some of them with fairy elements! N3 1.c6 2.Kc7 3.Kb8 4.Ga8 5.Gc8 6.Gc5 7.Gc7 8.c5 9.c4 10.c3 11.c2+ MAc6==. As a natural modification of ser-hs#n, the stipulation ser-s#n arises early. In just two years, 1949 and 1950, according to my fairy data-base, twenty-five such problems were published, many of them cooked. The first ser-s#ns were light compositions in the spirit of N4. 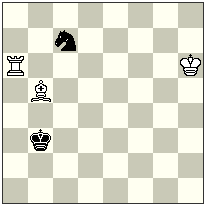 1.Rh6 2.Sc3 3.Qxd6 4.Bd2 5.0-0-0 6.Bb1 7.Qxa3+ Bxa3#. Development continued with the creation of masterpieces with a task character. The themes are mainly different promotions, especially AUW, double AUW, Super AUW, etc., often composed with neutral pieces. N5 1.e8S 2.Sxf6 3.Sd5 6.f8Q 7.Qxf3 8.Qg2 13.f8B 14.Bxh6 15.Be3 18.h8R 19.Rxh4 20.Re4 25.h8Q 26.Qxb8 27.Qe5 28.b8B 29.Bxa7 30.Bc5 32.a8R 33.Rxa4 34.Rb4 39.a8S 40.Sab6 41.Sc4 42.Qxe2+ Sxe2#. A double white AUW! N6 shows a neutral Super AUW with maximum economy of material 1.b8nB! 2.cxb8nG (nBf8) 3.nBxa3 (nPa7) 4.a8nQ 5.nQxg2 (nPg7) 6.g8nR 7.nRg6 8.h8nS+ nSxg6 (nRh1)#. A logical problem with good strategic motives is N7. The main plan is 1.Kg3 2.Kxh2 (Sb8) 3.b7+!? and now not 3…Kxb7 (Pb2)# but 3…Bxb7 (Pb2)+ 4.Kh3. After a long Pendel maneuver, Rg2 moves to a2. 1.Qf2 2.Rgg1 3.Qd4 4.Bc3 5.Ba5 6.Ra1 7.Ra2 8.Bc3 9.Ba1 10.Qg1 and now: 11.Kg3! 12.Kxh2 (Sb8) 13.b7+ Kxb7 (Pb2)#. When was the first help-compel mate, with black series (ser-hs#n), published? Unfortunately, I don’t have the answer. I only know that few have been published. I would like to show you N8, a problem published not long ago. 1.Sed3! 2.d1Q 3.Qf3 4.Sf2! 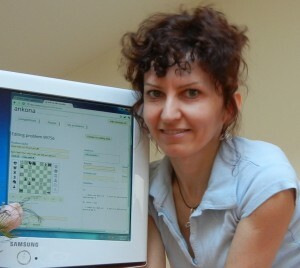 5.g1Q 6.Qxh2 7.Sg4! 8.Qh4 9.Qe7 10.Se5! 11.Qff6. This ends the eleven-move series phase and is followed by a selfmate in one: 12.Bc4+ Sbxc4/Sexc4#. The content is rich with bS Rundlauf, two bQ promotions, two self-blocks and a creation of a black battery. This is a lot for just eleven moves. 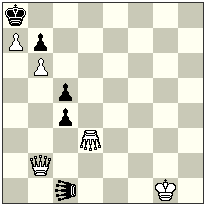 A – Since the main content of the problem is in Black’s moves, the prime goal is to create (a surprising) mating mechanism culminating with the last phase (s#1). To achieve this, a sufficient number of black moves is needed, often ten or more. B – The black series must have a thematic content or a combination of themes and ideas. The composer should also strive for a difficult solution. In the following problems these criteria are executed to some degree. In N9, the black series shows two Excelsior’s, reciprocal unpins between black Pawns and a pseudo-switchbacks of black promoted pieces to b7 and c7. 1.c6! 2-6.b1R 7.Rb7! 8-12.c1Q+!. The black series ends and selfmate-in-one follows: 12…Sc7+ 13. Qxc7#. It is interesting to note that Popeye solves this problem (and others of this kind) as a ser.hs#12, i.e., it disregards the last mating move although it is shown in the solution. In my opinion, the right stipulation here can only be ser-hs#13. N10 demonstrates an interesting theme which seems novel. Here, Black creates one battery which cannot deliver mate. This battery is abandoned and a new battery is created, which mates. 1.b1S! 2.a1R! (battery is created) 3.Ra4 (battery is abandoned) 4.Rf4 5-7. Kh3 8.Rg4 9.Rg2 10-11.Kg1 12-13.Rh1 (a new battery is created) leading to the finale: 14.Rg2+! Kxg2#. 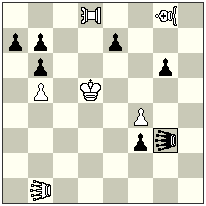 In N11, in the first phase, Black creates a B/Q battery: 1.Ke5 2-6.f1B 7.h1Q which is subsequently destroyed. A new, similar battery, is constructed on the opposite side of the board: 8.Qa8 9.Bc4 10.Ba2 11.Bb1 12.Qa1! and then 12…Qf5+ 13.Bxf5# with line clearance. Using fairy elements (pieces, conditions, etc.) a composer can demonstrate a wealth of new, and sometimes unusual, ideas. Often, such problems are also hard to solve. N12 1.Qxb3 (Ke4?) 2.Bb1=wB 3.Rc2=wR 4.Ke4 5.Rf7=wR Rxc6+ 6.Qxb1#, 1.Qxd2 (Kc5?) 2.Rc1=wR 3.Bc2=wB 4.Kc5 5.Rb7=wR Bxg6+ 6.Qxc1#. Line opening, Indian, Grimshaw on “c2”, unpins by the black Rook which opens line for Rd8. The following is a quartet of hypermodern compositions by Peter Harris. N13 1.b3 2.Ra4 3.Ra8 4.Rxa2 (+wPa8=wS) 5.Bxa8 (+wSh1) 6.Bg2 Sg3+ 7.Bxg3 (+wSf2), 1.Rg4 2.Bd5 3.Bg8 4.Bxa2 (+wPg8=wB) 5.Rxg8 (+wBg4) 6.Rh8+ Bh3+ 7.Rxh3 (+wBh8) #. Two nice promotions in S and B with specific PWC mates. N14 1.nPe6 2.nPxd5 (+wLOe6) 3.LOxd5-e5 (+nPb5) 4.LOxe6-e7 (+wLOe5) 5.LOxe5-e4 (+wLOe7) 6.LOxe7-e8 (+wLOe4) 7.LOxb5-a4 (+nPe8=nLO) 8.LOxe4-f4 (+wLOa4) LOxf4-g4 (+bLOa3) zz 9.LOxg4-h4 (+wLOa4)#. N15 a) 1.a1N 2.Nb3 3.Nd4 (+wPb3) 4.Nxb3 (bNb1) (+wPd4), Pd4 will prevent wK from moving, 5.Na3+ Nf6 (+bPb4). This defends against the check because the bP prevents bN from moving, 6.b3#. Pb4 no longer prevents bN from guarding e1-square. b) 1.a1VAO 2.VAOd4 3.VAOxb6 (bVAOb1) (+wPd4), without wPb6, the bK can now move to c7, while Pd4 prevents the wK from moving, 4.Kc7 (+wPb7 5.Kd7 (+wPc7) b8S!. This is not a check since b1-square is occupied by bVAO, a pinned piece under the circumstances, 6.Ke6 (+wPd7)#. N16 1.nKd2 2.nKe3 (+bPd2) 3.nKd4 (+bPe3) 4.nKc5 (+bPd4) 5.nKd6 (+bPc5) 6.nKc7 (+bPd6) 7.nKb8 (+bPc7) 8.nKa7 9.nKb8 (+bPa7) 10.a5 11.nKa7 12.nKb8 (+bPa7) 13.e2 14.d1Q 15.Qa4=S 16.Sb6=B (+bPa4) 17.a6 18.Ba7=R 19.e1R nKc8 20.Re8=Q#. It is only logical to combine ser-hs#n (=, ==, etc.) with the Pser. Such problems we can designate as Pser-hs#n (used also by Popeye). I have paid attention to this opportunity in my article The Wonderful (new genre) Parry Series (SG51/2010), illustrating it with N17. 1.b1Q 2.Qd3+ Kg1 3.Qg6+ Kh1 4.Qc6+ Rxc6+ 5.Kb1 Rc2 6.Kxc2#. This setting can be checked with Popeye as Pser-hs#5. N18 a) 1.Qc2+ Kh3 2.Qf5+ Rg4 3.Qd3+ Bf3 4.Qf1+ Kh2 5.Qf2+ Kh1 6.Kf1 Rg1+ 7.Qxg1#, b) 1.Qb6 + Rfd4 2.Qg6+ Kh1 3.Kf2 4.Kg3 5.Kh3 6.Qg3 Bg2+ 7.Qxg2#. A difficult fiver! N19 a) 1.Kd8 2.Rd7+ Kc6 3.Rd6+ Kb7 4.Rd7+ Ka8 5.Re7 Qc8+ 6.Kxc8=, b) 1.Ke8 2.Re7+ Kf6 3.Re6+ Kg7 4.Re7+ Kh8 5.Rd7 Qf8+ 6.Kxf =. Perfect Chameleon-echo with four men. N20 1.Rc2 2.Kb2+ Kd7 3.Ka1 4.Rc7+ Ke6 5.Rc6+ Kf5 6.Rc5+ Kg4 7.h5+ Kg3 8.h4+ Kg2 9.h3+ Kh1 10.Rc1+ Rd1 11.Rb1 Rc1 12.Rxc1#. The long and dynamic play, with surprising maneuvers by both sides, ends with a model mate. 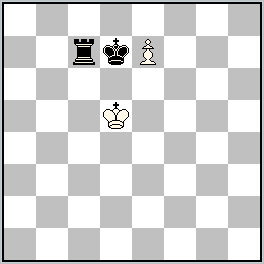 N21 is a task which shows three white R-promotions plus three annihilations of white Pawns with a goal of line openings for promoted Rooks. 1.Qxc5 2.Qxe3 3.Qh3+ Ke8 4.Qh8+ g8R 5.Qh5+ Rg6 6.Qb5+ Kd8 7.Qb8+ c8R 8.Qf4 9.Qf8+ e8R 10.Kxd3 Rd6+ 11.Qxd6 #. Great activity by the bQ (10 moves! ), plus a model-mate. I was planning to provide many new ideas, but due to personal matters, I had a limited time to work on them. Many problems which I started remain unfinished. I hope to provide additional insight at some later date. A) Reflexmates + Black series. Using the black series, one can compose many variations of reflexmates such as: ser-hr#n or ser-hr=n, ser-hr==n, ser-hr+n, Pser-hr#n, or Pser-hr=n, etc. In a ser-hr#n, Black plays a series of n-1 moves, then White forces r#1. The same rules apply as for a regular reflexmate, i.e., White is obliged to mate at any time during the black series, if possible. Aesthetically, such reflex-tries are obligatory. Semi-reflexmates are also possible. Unfortunately, Popeye is not yet programed to handle them, so it is difficult to compose them. An elementary example is N22. The try 1.bhPf5=nhP? 2.nhPf4=bhP 3.bhPf3=nhP 4.nhPf2=bhP 5.f1=nhQ with the goal of 5…Kh8 and 6.hnQf8=bhQ#, but here White must mate with 5…hnQf8=whQ#! Therefore Black must find another way to realize his Excelsior: 1.bhPf6=nhP! 2.nhPf5=bhP 3.bhPf4=nhP 4.nhPf3=bhP 5.bhPf2=nhP 6.f1=bhQ! 7.bhQb1=nhQ! and now 7…Kh8 8.nhQh7=bhQ#! And not 7.bhQd3=nhQ? 8.nhQd8=whQ#! Work with half-neutral pieces shows great promise. B) White + Black series. This is an interesting and promising new form. At first White makes a series of “x” half-moves, which we can call an introduction. After that Black makes its series of “y” moves as in a normal ser-hs#n (ser-hs=n, ser-hs==n, etc.). The stipulation in N23 is 2→ser-hs#7. White makes two moves, 1.c8R 2.Rf8!, followed by Black, who makes six moves, 1- 5.f1S 6.d1R followed by the finale 6…Rf3+ 7.Sg3#. In N24, the introduction shows creation of a White Indian: 1.Bc3 2.Rd4!, followed by Black series: 1.Kf6 2.Bc1 3.Bb2 and follows s#1: 3…Re4+ 4.Bxc3 #. Similarly: 1.Rb4 2.Bd4 & 1.Kf4 2.Bd8 3.Ba5 Bg1+ 4.Bxb4#. Both sides provide rich thematic play with model-mates in economic construction. N25 1.Qd3 2.Qb1 & 1.axb1S 2.Sd2 3.Sf1 Se3+ 4.Sxe3#, 1.Sc3 2.Sb1 & 1.axb1B 2.Bc2 3.Bd1 Qf3+ 4.Bxf3 #. Reciprocal sacrifices by the wQ and the wS on b1 in the introduction, followed by promotions, Dentist-theme, creation and transformation of masked black batteries and Umnov. C) White introduction + Pser. An interesting modification of Pser. Here the Pser-hs#n play follows White introduction. The introduction should have thematic content and also be difficult to solve, otherwise, it is not desirable. In N26, the introduction contains only two moves, which are hard to find: 1.Rf8 2.Rd8! White destroys its S/R battery, and then moves its Rook into an ambush. After the Pser play: 1- 3.d3+ Kd1 4.c2+ Ke1 5.d2+ Kf1 6.d1S 7.c1R! we have a selfmate in one: 7…Rd3+ 8.Se3#. The try 1.Rxd7? 2.Kd1, after the march of the c-Pawn (which is needed because of the cook), is 1-3.b3+ Kd1 4.c2+ Ke1, and the white King has no more parry-moves for moving to “e1”. Another analogy is that White destroys S/R battery while Black builds the S/R battery. I think there are some terminological problems when using the name series help-selfmate in “n” (as used by Popeye). I’m not sure it will be accepted as an official name. Other names are possible, of course, but a historical inevitability is the standardization of all fairy terms, names, and symbols which are used in programs and under diagrams. This work should be one of the most important duties of the WFCC. I am also hoping for a speedy incorporation of self-problems with black series into Popeye. In regard to aesthetic criteria of help-compel mates, most of it was defined in my previous article in StrateGems (SG32), although additional work in this area is also possible. Another area of interest is the Pser series (including the introduction element). Creative work is always an important element but fast computers will be needed for checking these problems. My recommendation to composers is to start with schemes that incorporate fewer than 8 or 9 moves. More complex scheme will be difficult to verify. One can also work with black series (maximum 6-7 moves). The key here is to have a good thematic content. Finally, I’ve updated Ankona section in Software – have added explanations about the functionality with many examples of the screens. The only part left is Competitions, but I’ll try to add an information about it soon. The Russian version of Ankona section will be ready in 1-2 days. Sorry for the inconvenience! Russian translation is ready about the screens of WinChloe at WinChloe section. The Authors zone in “Infos” is no more sensitive to the mouse wheel. When the fairy pieces are reinitialized, the pieces previously defined are recognized and don’t have to be defined again. For those who uses Ankona: a competition “Julia’sFairies-HSP-2012” is created for Julia’sFairies Tourney. You can submit your problems for the tourney, using [Submit to competition] option of the diagram-screen. Some more information about Ankona is coming soon at Ankona section…. (24-26/05) Three original problems are added to PAGE-6 – No.18,20 by Alex Levit and No.19 – by Mihail Croitor. Welcome to the new authors! (28/05) My own original No.21 is added to PAGE-6 – moves of neutral locusts only! Section Links is updated. The information about the tourneys sent by my readers is also added there. Useful links from you are very welcome! 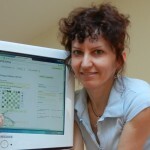 See the announcement of the tourney JULIA’S FAIRIES — HSP — 2012 in the Category Tournaments and awards. Two original problems are added to PAGE-5 – No.16 and No.17 by Petko A.Petkov. Thank you very much!! 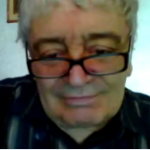 See the direct links to Petko A. Petkov’s articles in the Articles section of the Top menu. See the announcement of tourney JULIA’S FAIRIES — HSP — 2012 in the Category JuliasFairies internal adds. One more page with original problems is added – PAGE-5 – and starts with No.16 – hs#4,5 by Petko A.Petkov! RULES: Help-self problems (HSP) of any possible types: Help-self mates (HS#), HS=, HS==, HR#, HR=, etc. in any number of moves. All pieces (white, black, neutral, half-neutral, etc) and conditions are allowed! The thematic “Fairy element” (pieces, conditions) should be demonstrated in play at least in one battery or (plus) anti-battery of any type. The problems should be computer-tested. 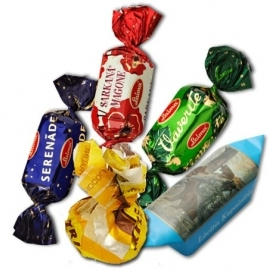 The Award will be published at the site in December, 2012.
to the 1st, 2nd, 3rd Prizes: Selection of Latvian sweets! Fairy elements: white direct battery created by Re6 (forward piece) and Gg8 (rear fairy-piece); black anti-batteries – Bd5/Gd8 and Rd5/Gd8. Any anti-battery is always thematic as “fairy element”. Fairy element – creation and play of two Anti-Circe genre specific batteries (some authors call them Ecto-batteries) – white battery Re1/Kd6 and black battery Re8/Kc6. After play of Rooks (as forward pieces) two Kings are activated and give check (mate). A good example of fairy-battery which is created by orthodox pieces only, but which demonstrates fairy-element according to the rules of condition Anti-Circe!